OMG you guys. I picked up my chairs at the upholsterer’s this afternoon and so in love with them I am that I had to share with you straight away. I couldn’t wait. 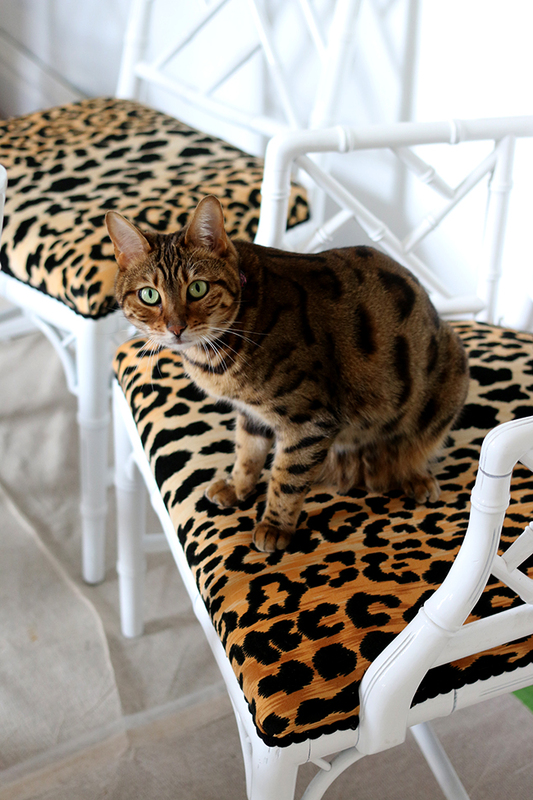 If you have been following along with our little dining room remodel, you’ll know that I decided to recover all my chairs in Braemore Jamil Natural – a most wonderful leopard print fabric that I’ve had a ‘thing’ for for quite some time now. 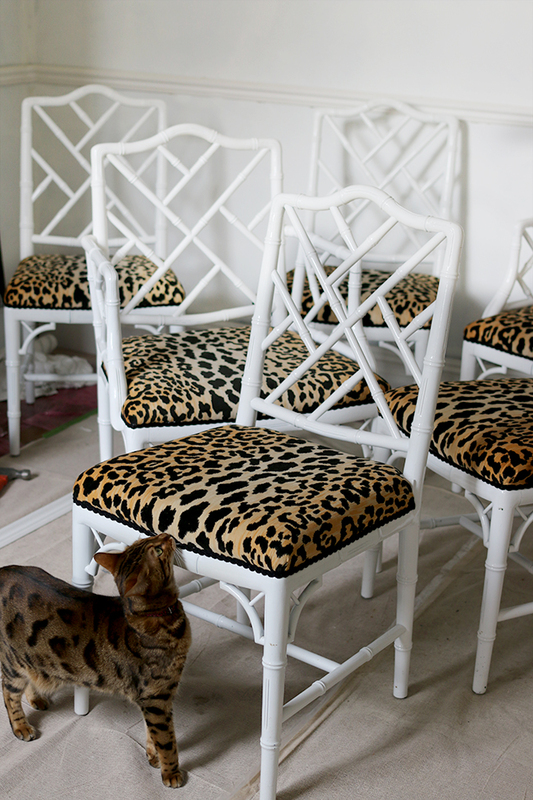 Well, I’ve always been partial to leopard print (seriously, I’ve loved it for decades now) so when it came to choosing a fabric for the re-upholstery, it didn’t take me long to decide that this was gonna be the one. 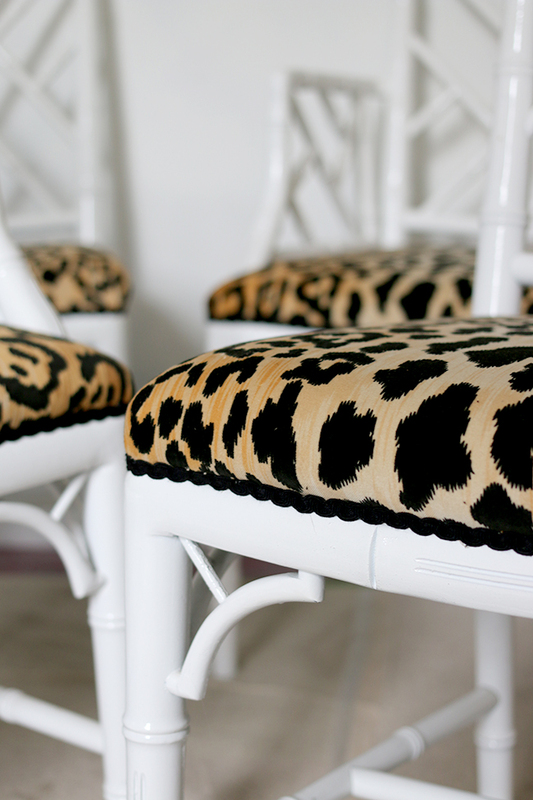 Want to see my tips on adding leopard print as a neutral? Check it out here. I ordered the fabric from My Fabric Connection. Sadly, it doesn’t seem to be available anywhere in the UK so I had to stump up and get it delivered from the US but happily, they do ship internationally. For 3 metres of fabric plus delivery and custom charges, all in I paid just over £100 which to be honest, for 6 chairs plus enough left over to make myself a few cushions, I think it’s money well spent. The chairs I’ve had for a couple of years (after endless searching on eBay, they are up there with my favourite finds) and so I took them to Brian over at MD Upholstery in Stockport who I’ve used in the past and has always been great. They took around 2 weeks to finish which was fine as we didn’t need them whilst working on the room and cost me £210 for all 6 chairs. So, for just over £300 for fabric and upholstery, I have what feels like a brand new set of chairs! Just in case you haven’t seen it yet, you can see this post for the full design reveal and how the chairs will work with the new look room. Still plenty more to do here but at least we’re making some progress. 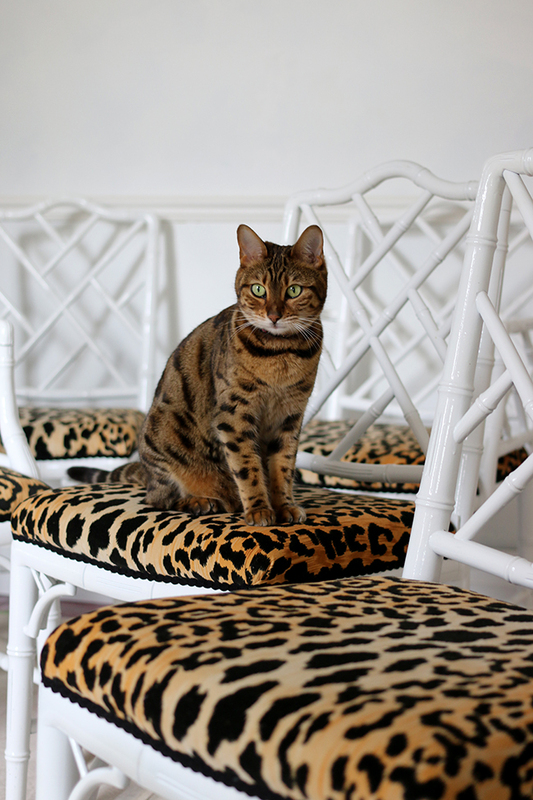 As you can see, Meisha decided she would graciously model the chairs for me. I wonder if she realises she’s the inspiration for the new look? 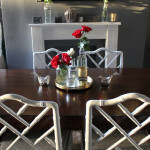 So what do you think of the chairs? I’m utterly in love myself. 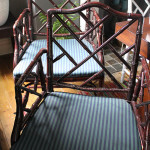 Before and After: Faux Bamboo Dining Chairs Reveal! Hope the cat keeps his claws off them! Now that is really useful information! I have been putting off reupholstering some chairs for fear of feline destruction, but velvet may be the way forward. Omg all the yeses!!!! They are fantastic!! I’ve been wanting some for YEARS. Maybe I’ll have to look on EBay. Also fan freakin tastic choice in upholstery. They are gonna be amazing in the new space. oh i LOVE them!!!! they look perfect! 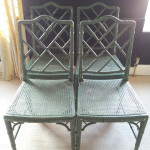 Hey, quick question: were your side chairs originally with caned seats? I only ask bc my set is and I’m not super loving the tied on cushions in grody terry cloth fabric. The finish on these is lovely with the trim. is perfect. A small thing, but really adds class. Hurray for you! The chairs are divine!! So beautiful! I love your taste girl! I also love your kitty! Gorgeous! 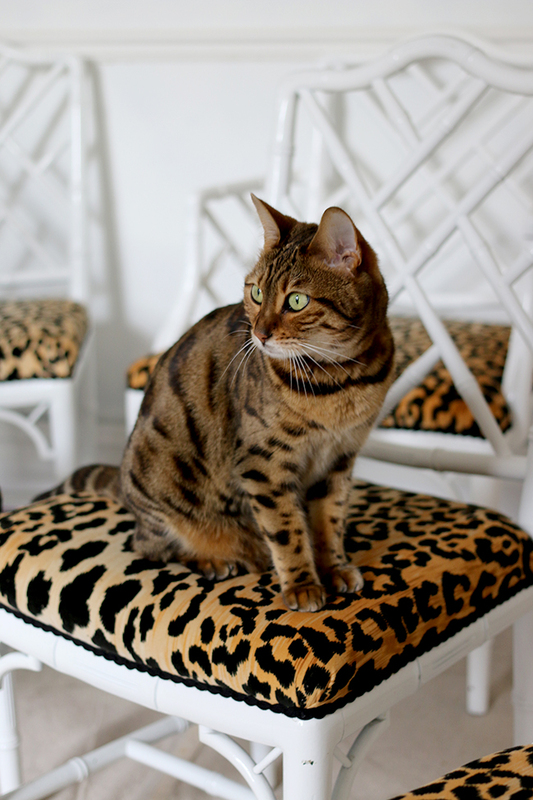 I had almost given up on finding the “right” leopard print for a side chair. Couldn’t find one locally with black instead of dark brown. Just ordered a sample of this fabric and am so excited! 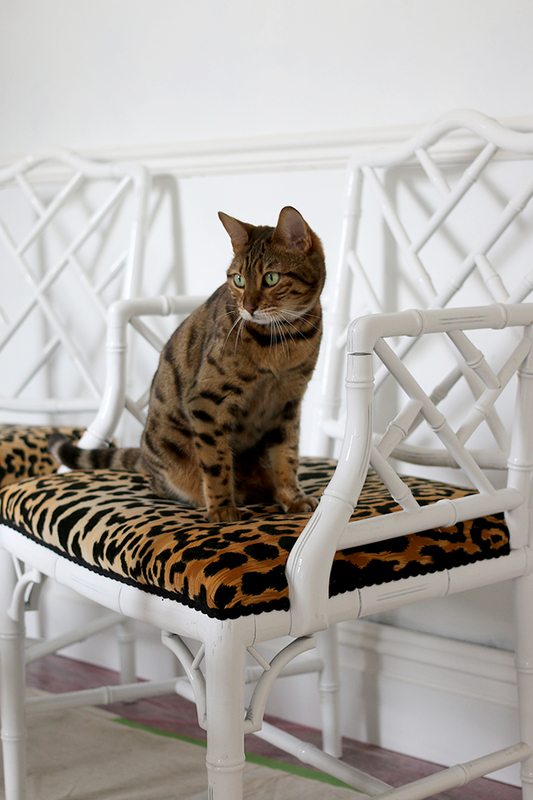 BTW, your cat and your chairs are beautiful!!! OMG gorgeous! Just beautiful. And Meisha is such a beautiful cat! I would love to give a cat a home but I’m worried the hair situation would drive me nuts. 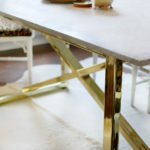 How do you deal with it on clothes/upholstery? Please tell me about your cat. What breed is she. She is just beautiful, her markings are fabulous!! These chairs have jumped out of my dreams with cat and all. No really! That is exactly what I have wanted for forever! These chairs look deliciously good. Amazing! Not sure what I’m loving more chairs or the cat! ?